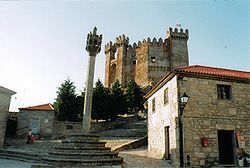 The village of Penedono, Viseu District, in northern Portugal, became part since last February, the European Network of Cities for All Villages. The first signs of human occupation in the area date back to centuries of Boulder V / IV BC (Neolithic middle / end). This population lived pastoralism, hunting and rudimentary agriculture. The first inhabitants of this region gave importance to the cult of death. This is well visible in multicore megalithic necropolises in Lameira de Cima, place of Senhora do Monte, parish Penela da Beira and Castainço. The Romanization brought Penedono pottery construction, industrial and domestic. is also this that starts the mining, especially gold. In the aftermath of the Liberal Revolution in the nineteenth century, with the addition of several villages village Penedono county is high. The olive oil has always been one of the cultures of the Mediterranean peoples. The region Penedono was no exception. In Póvoa de Penela, one of the parishes, existed in times three olive oil rmills. Nowadays there is only one. It was totally intervened. Currently this mill was transformed into a museum where it is explained to visitors the whole process of cultivation of olive oil from the olive harvest olive groves down to arrive at the table, in the form of oil or treated to be consumed as a snack meals. The Penedono tourism post office is located in the historic center, particularly in the former building of the Town Hall and Jail Correição.